It seems an impossible conundrum: budgets are under growing pressure, yet the number of people requiring more accessible housing is on the increase. But is the solution as hard to find as we think? Asks Robin Tuffley, Marketing Manager at Closomat. Latest figures indicate that 1.8m people need accessible housing. This figure is expected to increase in the coming years given the ageing demographic of the UK. Also, there are more elderly people living in social housing. Indeed, one report maintains the number of older renters (in private and social housing) has more than doubled in a decade, further intensifying pressures on local authorities to provide appropriate housing solutions. The number of disabled people requiring specially adapted accommodation also needs to be considered — approximately a further 2.75m people. It is proven that enabling people to remain in their homes for longer has a positive impact in every way. A new report has suggested that spending £270m on Disabled Facilities Grants saves more than double that amount from health and social care costs1. It is also established that it delays their potential need for residential care. Enabling people to live independently enhances their feeling of wellbeing, psychologically having a positive impact on their health — the Centre for Ageing Better maintains home aids and adaptations reduce depressive symptoms by 53%. It is important to ensure new-build social housing stock is built to Lifetime Homes. For example, ensure doorways are wide enough to accommodate a wheelchair and make sure ceilings are strong enough to accommodate the future installation of a hoist. These factors are not difficult to address, nor do they have any major impact on the build cost: apply the ‘year of care’ theory — balancing the difference between spending on some capital equipment that enables someone to undertake daily tasks independently and safely against the cost of providing care support to assist them. That is key — the move away from the ‘bottom line’ figure to the whole cost. There is growing pressure for an accessible housing default to be included under National Housing Policy. The social housing sector is having to ‘make do’ with existing housing stock. Only 12% of homes in England meet current minimum accessibility features. Recent studies show that by making even small changes, people’s difficulties with daily living activities — including their personal and intimate care — can be reduced by 75% and their ability to perform those everyday activities without help by 49%2. Bathrooms are the most common form of home adaptation, with the toilet being the most common fixture to be addressed. There is a generalisation that adapting the bathroom means replacing the bath with a shower/wetroom or adapting the toilet — be it by simply adding a grab rail or installing a ‘wash and dry’ toilet. 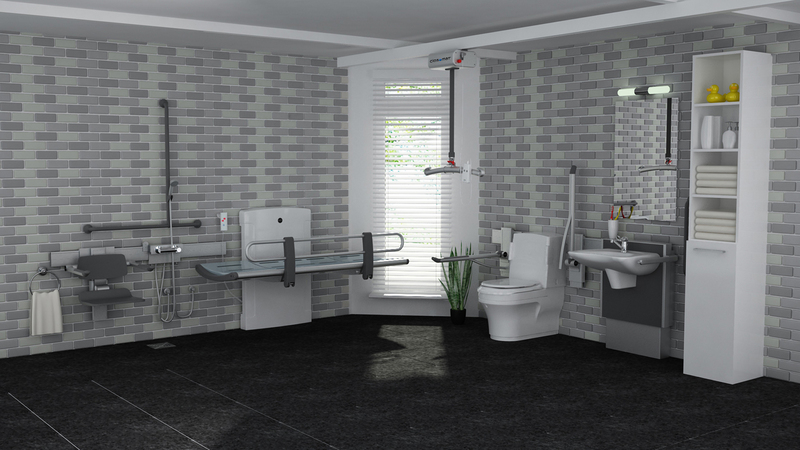 There are other fixtures and fittings that can make a significant difference to the occupant and their carer(s) — items such as ceiling track hoists, and toilet lifters. The importance of the hoist is recognised already by its inclusion as a potential addition in updated Lifetime Homes criteria. Already over a quarter of a million people cannot move around their own home. We have a growing obesity problem. 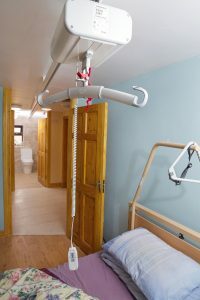 A hoist spares the care recipient and carer being exposed to risk of injury when executing a transfer around the home. And we’re all familiar with riser recliner chairs. Did you know there is a similar version for over the toilet? If someone needs help to get out of a chair, they will need help to get on and off the WC. They may not need a hoist, so would rely on a carer to help them. Closomat’s own cost analyses have shown that, where appropriate, it is more cost-effective to purchase a toilet lifter, or even a ‘top of the range’ shower/wash and dry toilet (that enables the person to go to the toilet without having assistance) than provide care support for these tasks for even a few months. Again, it is about looking at the ‘year of care’ cost, not just the individual capital cost. There is no point putting in a piece of equipment that will just suffice, especially if it will only suffice for a few weeks or months as the recipient’s condition deteriorates. To achieve best value for all involved, whatever fixtures are installed need to be fit-for-purpose, and futureproof the adaptation so it can evolve over time. Bear in mind, particularly with users with limitations, fixtures are subjected to higher than average stress loads (transferring from a wheelchair for example). We have experienced incidences where, for example, a basic ‘clip on’ type bidet seat has been supplied as a cheap, quick fix, only to be replaced several times because it has broken, culminating in it being removed and replaced with one of our shower toilets. There is another consideration that is often overlooked: longevity/durability. In terms of best value, why spend money on something that is only a temporary fix knowing that within months it is going to have to be replaced? The extra cost of the replacement would most likely have covered an up-specification to a better quality solution in the first place, before taking into account everyone’s time resolving the problem. Best value can also be obtained by a nominal investment in annual servicing and maintenance. A service and maintenance contract removes much of the headache, time and cost of liaising with tenants, organising engineers, and ensures an optimised lifespan of the equipment, justifying its cost several times over.